The World View Display panel has various options that affect how the map is drawn -- it's colors, projection, and so on. Specifies the dimensions of the picture, in pixels. Larger pictures obviously take longer to generate. At the moment you should be careful to keep the dimensions in 1:3 ratio (320 x 240, 640 x 480, 800 x 600, etc). See Known Issues and Bugs. These specify the centre point of the map. If you are using the Globe projection, changing the Longitude will 'spin' the globe around its axis. Specifies the magnification. Larger numbers zoom in to show smaller areas of the world. The latitude and longitude (see above) will determine which part of the world is zoomed. See also Known Issues and Bugs. Produces a black and white outline map. Very useful if you want to print out the map. Note that when Outline is selected, the Black Borders and Bumpmap settings will be ignored. There are multiple projections available, including a pseudo-3d globe. 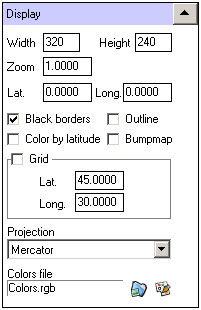 Select the required projection from the drop-down list. This displays the name of the colors file that is used by the map. The 'select' and 'edit' buttons beside this file name allow you to select other color files, and to edit or create color files.